Tool Box Tuesday – Free Patterns! Free patterns? Sounds too good to be true. Well it is true!!! Fabric companies provide free downloadable patterns to show off their new fabric lines. The fabric designers themselves, or other designers work up a pattern that is based on a new fabric line to help show how it might be used in a quilt. These patterns are free downloadable PDFs. What you need to do is to look up your favorite fabric company website and then look at the navigation tabs – you should find one that says “Free Patterns” or “Free Projects”. I have been working with Windham Fabrics for a few years and just recently started working with RJR fabrics. Let me show you how how these two sites work. 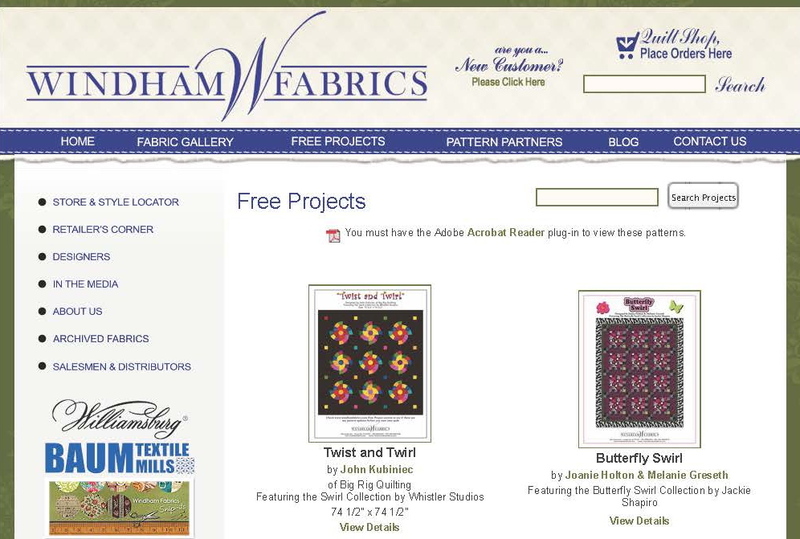 If you go to the home page for Windham Fabrics you will see something that looks like this. CLICK HERE to go to their page. Clock on the “Free Projects” tab (third from left) and up will pop the following page. Search through the various patterns that are there – if you find one you like – download it. YES – FOR FREE!!!! If you know the fabric line, type that into the box – just for practice type in Spin. A page should appear that would have the pattern I designed for this line which is entitled Twist and Twirl. Click on the pattern and the PDF for the pattern will pop up and you can save it to your computer. 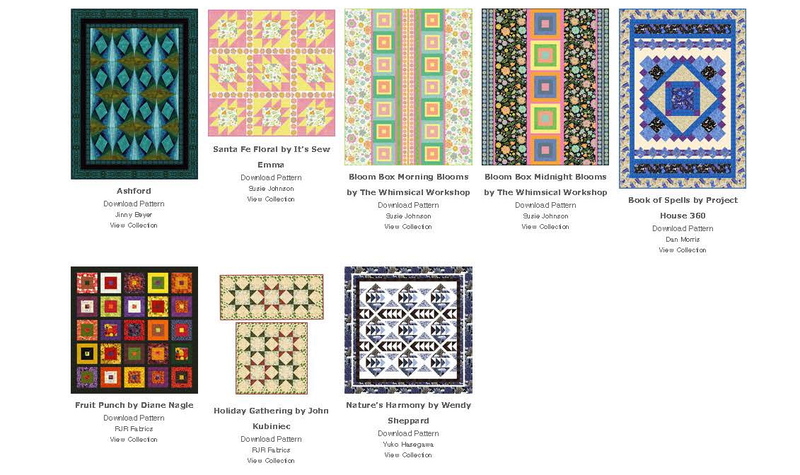 If you type in Big Rig Quilting in the search box all the patterns that I have designed for Windham will pop up. The Windham search box lets you search by Fabric Line, Fabric Designer and Pattern Designer. RJR Fabrics has a slightly different layout. 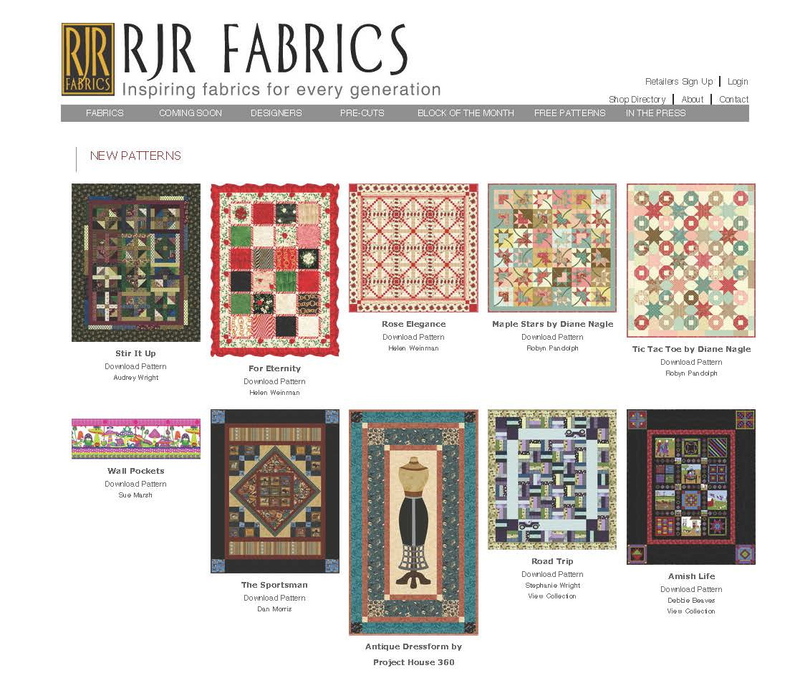 CLICK HERE – to go to the opening page for RJR Fabrics On their opening page there is a tab that says “Free Patterns” (2nd from the right). Down at the bottom of the page is my pattern entitled Holiday Gathering. Click on the pattern and the PDF for the pattern will pop up and you can save it to your computer. As you can see there are a wealth of FREE PATTERNS that are available on just these two fabric companies web sites. Explore other fabric company sites to find other patterns. Happy Web Surfing! I hope you find some great patterns that you can use.